As September gets closer with the beginning of the “Journey to Force Awakens”, we’re getting more of an idea of Disney’s post-Return of the Jedi world. One of the first tastes will be Marvel’s Shattered Empire comic series, which introduces new heroes—and picks up the Star Wars story literally mid-Yub Nub. 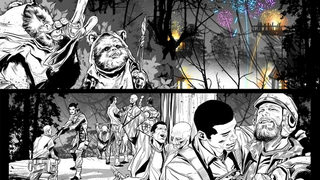 Marvel have revealed a new textless preview of Shattered Empire’s first issue, which pretty much picks up during the end of Return of the Jedi—the Ewoks and Rebels are having a party on Endor, the Rebel fleet is chasing down Luke fleeing the exploding Death Star with his father’s body. It’s those same moments, from nearly 40 years ago, just in the pages of a comic book. Presumably the beginning pages of the books. But it’s not really the preview that tells us anything about Shattered Empire, or what’s to come in the 30-year gap between Return of the Jedi and The Force Awakens. An accompanying interview on StarWars.com with series writer Greg Rucka, however, does give us some more to go on—more specifically, that the series will not focus on the efforts of Han, Luke, Leia and the major players of the films. Instead, the focus is on two new Rebel characters: Shara and Kes Bey, a husband-and-wife team of pilots who were present at the battle for Endor. ‘We’re gonna follow Luke for four issues after Return of the Jedi.’ That was never what my mandate here was. But, with that in mind, we see Luke, we see Leia, we see Lando, we see Han, we see Chewie. We see what they are doing, and while the stories are not about them — they’re about Shara Bey — the stories link. Issue 1 sort of stands alone. Issues 2 and 3 follow the same story path; they’re like a two-parter, and they lead into the fourth. As it stands, we meet Shara in [issue] 1 during the Battle of Endor, and we come out of the Battle of Endor, and then we cover about three to six months total in the series following the Battle of Endor. In that time, Shara and her husband find themselves in some situations only incidentally in the path of the principles [sic], and in other situations, working quite closely with them. The Empire still has resources. The Empire still has an enormous fleet. They may be in disarray post the Battle of Endor, but to think that in that vacuum people aren’t stepping up [is shortsighted]. All these people are not about to go, ‘Oh, well, I guess we were on the wrong side. It’s over, then.’ [Laughs] There’s a Moff out there who’s like, ‘Right. I’m emptying the bank accounts, I’m changing my name, and I’m going to Aruba.’ You know there is. But for every Moff who does that, there are five who say, ‘Like hell am I leaving this post. We’ve got stormtroopers for a reason. You get out there and you shoot every last one of these upstart insurgents, these terrorists, and you make clear to them that the rule of law still stands.’ So it does get ugly. There’s much more in Rucka’s interview—including an implication that at some point Leia asks Rebel Leader Mon Mothma about that time she showed up in Revenge of the Sith and knew Leia’s real mom—but for now, the main takeaway is the picture Shattered Empire is start to paint for this new chapter of the Star Wars saga: What we thought was the end is just another beginning. Star Wars: Shattered Empire #1 will be out September 2nd—go to the link below to see a few more preview pages and more from Rucka.